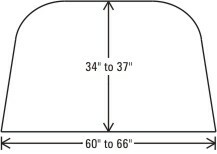 These are our most common sizes of standard window well grates. Typically used for metal wells or metal wells that have had concrete poured around the well such as a sidewalk or patio. Note: These grates are not intended for use on rectangular shaped wells if your well is rectangular – see the Rectangular Grates page. If your well is a precast concrete well with multiple sides, see the grates for precast wells here. For the half moon shaped window well only. Designed to accommodate wells 30″ to 40″ inches in length along the house and projecting out from the house 15″ to 18″. Designed to accommodate metal or concrete wells 36″ to 52″ (inside dimensions) along the house and projecting 15″ to 18″ out from the house (inside dimensions). Designed to accommodate metal or concrete wells 45″ to 60″ (inside dimensions) in length along the house and projecting projecting 18″ to 24″ out from the house (inside dimensions). Designed to accommodate metal or concrete wells 45″ to 60″ (inside dimensions) in length along the house and projecting 22″ to 25″ out from the house (inside dimensions). Use Optional Security Kit Model SK6 with L6 Grate. Designed to accommodate metal or concrete wells 60″ to 66″ (inside dimensions) in length along the house and projecting 22″ to 25″ out from the house (inside dimensions). Use Optional Security Kit Model SK6 with XL6 Grate. Designed to accommodate metal or concrete wells 45″ to 60″ (inside dimensions) in length along the house and projecting 30″ to 33″ from the house (inside dimensions). Use Optional Security Kit Model SK8 with L8 Grate. Designed to accommodate precast concrete wells 60″ to 66″ (inside dimensions) in length along the house and projecting 30″ to 33″ from the house (inside dimensions). Use Optional Security Kit Model SK8 with XL8 Grate. Designed to accommodate metal or concrete wells 45″ to 60″ in length along the house and projecting 34″ to 37″ from the house. 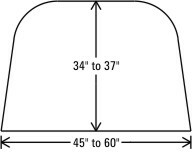 Use inside dimensions only when measuring. Use Optional Security Kit Model SK9 with L9 Grate. Designed to accommodate metal or concrete wells 60″ to 66″ in length along the house and projecting 34″ to 37″ from the house. Use inside dimensions only when measuring. Use Optional Security Kit Model SK9 with XL9 Grate.